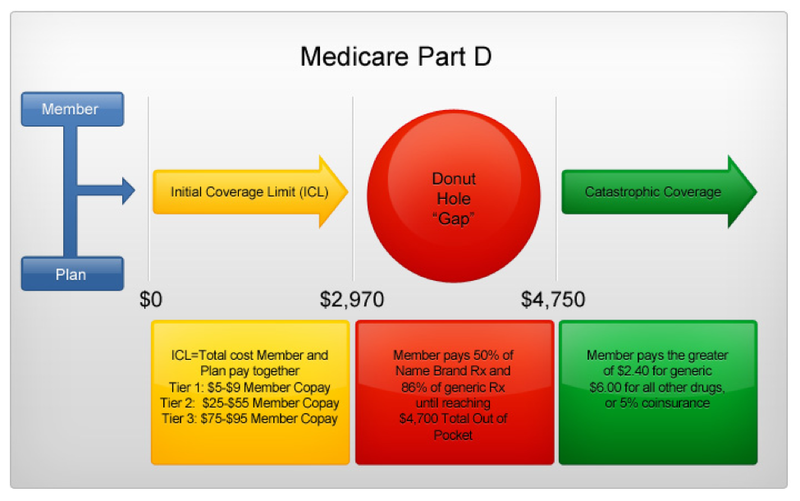 Medicare Part D, is also known as a Prescription Drug Plan or “PDP,” was created under the Medicare Modernization Act of 2003 to assist in covering the costs of prescription drugs. Prescription drug coverage is only offered by private companies contracted with Medicare through stand-alone plans (for beneficiaries who have Original Medicare) and through HMOs, PPOs, and PFFSs (for beneficiaries who have a Medicare Advantage plan). Everyone who has Original Medicare or Medicare Advantage is eligible to enroll in Part D. Enrollment in Part D is voluntary. Private companies that offer Part D coverage are permitted to propose their own benefit plans, as long as the overall value of the plan is at least as good as the basic plan outlined in the 2003 Medicare Act. Different plans offer various lists of covered medicines (called a formulary), and at different costs. Beneficiaries should evaluate the various drug plans available in their area to find the one that best fits their needs. You did not join a Medicare drug plan when you were first eligible for Medicare, and you didn’t have other creditable prescription drug coverage. Creditable Prescription Drug Coverage is coverage that is expected or anticipated to pay, on average, at least as much as Medicare’s standard prescription drug coverage. Typically, this coverage is provided from an employer or union. Anyone who has this kind of coverage after they become eligible for Medicare can normally keep that coverage without paying a penalty if they decide to enroll in a Medicare Prescription Drug plan later. You did not have Medicare prescription drug coverage or other creditable prescription drug coverage for 63 days or more in a row. The cost of the late enrollment penalty depends on how long you didn’t have creditable prescription drug coverage. Currently, the late enrolment penalty is calculated by multiplying 1% of the “National Base Beneficiary Premium” which is $33.13 for 2015, times the number of full, uncovered months that you were eligible but didn’t join a Medicare drug plan and went without other creditable prescription drug coverage. The final amount is rounded to the nearest $.10 and added to your monthly premium.